« January in the Algarve. I can tell it has because all the young almond trees are putting out leaves. 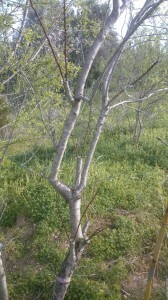 And my black plum tree (ameiceira preta) is in flower! I am excited because I only planted it a month ago. It was a good size tree when I bought it and hopefully I’ll see a few plums! This month has essentially been about grafting. I had started grafting a few olive trees using cleft grafting and a splice union graft. I think I pretty much have got the hang of cleft grafting. The splice joint takes more time and effort. 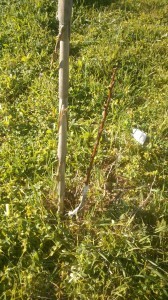 It also is not as strong as a S(or J) type graft where the scion and root stock actual interlock. I’ll have to learn this for next year. 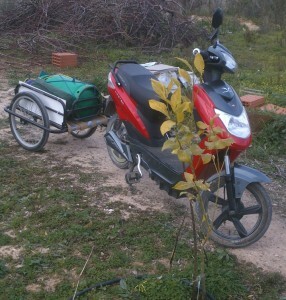 A neighbour whose land borders mine kindly gave be some peach tree branches to use for firewood. I must take him to lunch. I am sure he is an interesting man. He is Portuguese. He was 30 odd years in Africa as a colonial soldier . 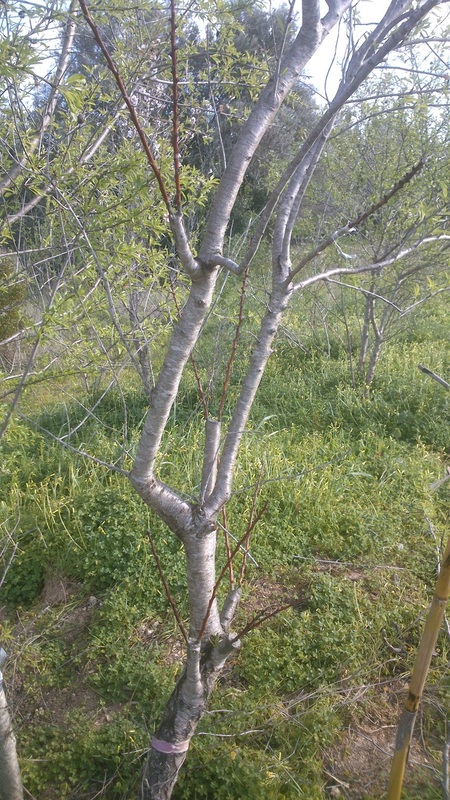 Anyway, I then had the brilliant idea of grafting some of these branches onto my bitter almond trees and excess almond root stock. So fingers crossed it works and I am able to coax something sweet from the otherwise inedible. Splice graft – peach scion onto almond root stock. I germinated some tomato seedlings! Two varieties, ‘Alex’ and ‘Sweet Million F1′. Sweet million really came through for me last year, despite being neglected and being put in heavy clay soil. So I hope for a repeat this year. 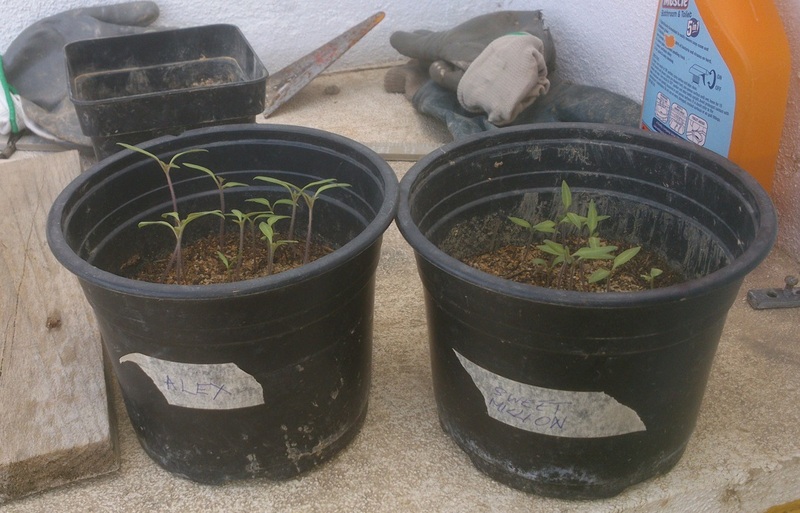 Alex who visited last spring, had given me the ‘Alex’ variety of monster tomatoes in 2012. This was in England, so I had the seeds with me. Hopefully they will do well here. 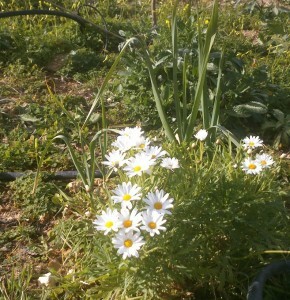 The tiny cutting of this daisy type plant from England survive the winter and is really thriving! Linda says they are Chrysanthemums. 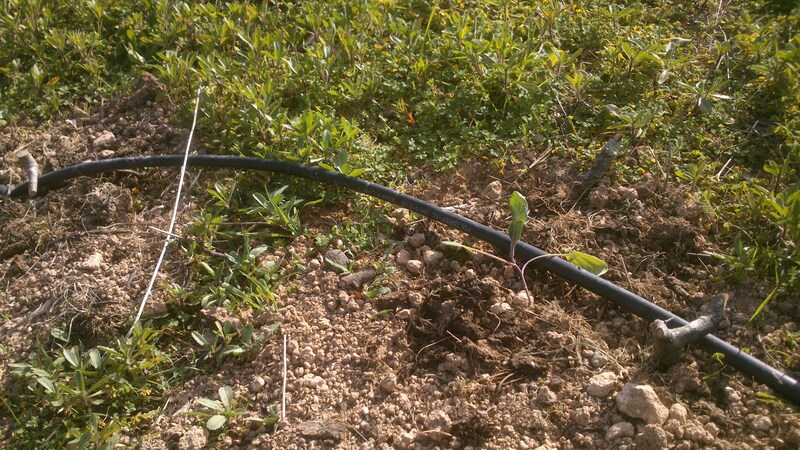 I put a bit of irrigation pipe alongside a part of my bother with the front road and have stuck in fig and pomegranate cuttings. 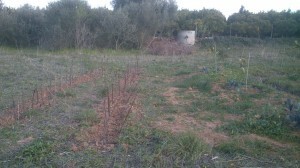 There are also a some young carob (alfarobeira) trees growing. I also planted some Portuguese cabbage (coeve galega) here. 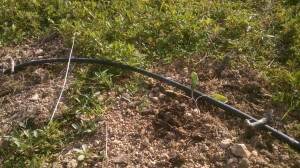 Here is my fig tree nursery. 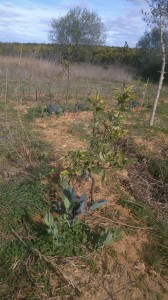 Some cabbages and green peas growing at the Seven Sisters ditch (swale) around the young orange trees. I find that grass cuttings on top of small shredded olive branches and leaves and wild fennel stems works well. The latter support and help the grass cutting to filter down the organic layer slowly. Otherwise the grass on it’s own would compact tightly and decompose far too quickly. Which is not bad but as my friend Martijn said it’s gone too soon. 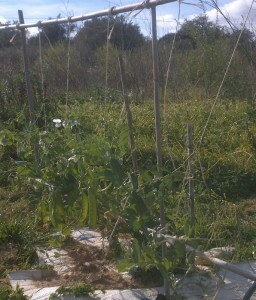 My just eight green pea plants doing well. Already had a bowlful. Loving my Vortex gingabike. And the trailer it can pull. I used it to buy some wood and go get a bottle of gas from town. It goes very well with the trailer attached. Well, that’s all for February. I broke a bone in my hand a couple of weeks back which has slowed me down but I can’t stop. Staying warm in winter has been a challenge. Thank goodness I had my stove. It has been brilliant. It does hot water for my bath and I have cooked a lot of stuff on it too. This entry was posted on Saturday, February 28th, 2015 and is filed under Sustainable Living. You can follow any responses to this entry through RSS 2.0. Responses are currently closed, but you can trackback from your own site.